Shhhh.... Don't tell my kids, but what they think is "candy" is actually their blend of healing supplements! Oh wait, they already know. In fact, they beg for it each day. Necessity was the mother of invention again in our house, and so I invented these. When you're looking at roaring inflammation in little bodies (still!) and a new freedom from oxalate restrictions (hurray! ), mixing up turmeric with a bunch of other goodies sounds like the best approach to take. God be praised, my children love it! If you have a turmeric hater, I won't say this will convert them, in fact, I'd probably tell you not to make this recipe at all. I don't care for it except in a nice curry myself. But if you don't mind turmeric flavor and want to include more in your diet, this is easy and convenient! The best part to me is that all those other supplements and supports I was supposed to be giving them and kept forgetting, now go in their daily candy! Feel free to flex this to your needs, I'm always wondering what else I can hide in their daily bite of golden goodness. You may need to warm some to soften. My oven has a "warm" setting which is perfect. Thoroughly mix the whole concoction, and check on it as it cools in case the fat separates some. When cool, cut into squares. Or pour warm into molds for a fun treat. If you use less "liquid" ingredients, you can just scoop it with a spoon and eat like golden peanut butter. 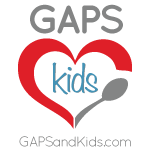 My kids are taking 1-2 tsp of this concoction daily and they love it! This is not for the faint of rich desserts. In fact, you probably don't want to make this unless your body is ready for intense fat in every single bite. Mmm... I make this when I'm hungry all the time and can't seem to eat enough. I like it a little better than the "fat-bomb" recipes I've seen floating around. And this is fancy schmancy enough to share with guests. In small dishes. With fruit. And whip cream to make it lighter. It is intense. Add softened butter, or melt slightly with chocolate. Gently combine. Be careful of anything cold hitting hot melted chocolate. Add salt. Add sweetening (being careful to not add cold liquids to hot chocolate). Taste and see if sweetened to your liking. You probably will want to double or triple the sweetening I suggested. Remove from heat and allow to cool some. Beat egg whites in a separate bowl until soft, but not quite firm peaks form. When chocolate cool enough to touch with your finger, add yolks and gently fold in. Add vanilla. Sprinkle gelatin into mixture mixing well so no clumps form. If chocolate has cooled too much, gelatin won't mix well, jut return to warmth for a minute or two. Dump egg whites into chocolate mixture and fold gently until mostly incorporated. Transfer to fridge, checking occasionally to fold together more. Can transfer to individual dishes while still soft, or simply cool in bowl till firm. Garnish with berries, cocoa nibs or whip cream if desired. Pretend you are french while eating and love fat. In the past month I noticed that my older daughter wakes up happy in the mornings. I wish I could say when that started, but the sad things is, we don't tend to notice health. Maybe it started in April or May when the longer hours of daylight seemed to suddenly mean that she needed less sleep, and she started waking me up an hour and half earlier in the mornings. (Yaaawwwwn!) Or maybe it was earlier than that. I'm not really sure. We only realized it recently. Regardless, this is new! This is healing! The first 4+ years of her life, every day started with tears and whining and cuddling with mommy for well over an hour until she could be happy about the day. To have her start the day with, "I love you mommy!" 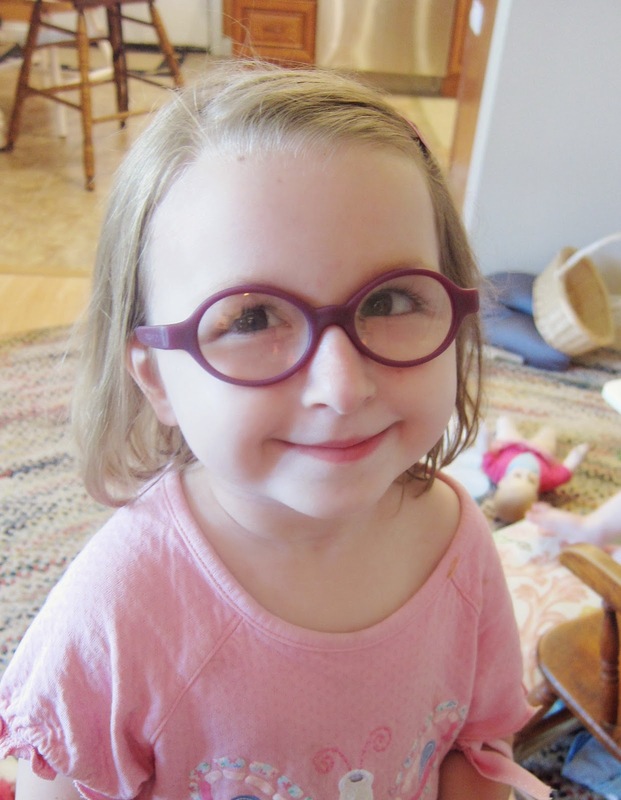 and smiles and giggles and encouraging her little sister to wake up and play, that is wonderful. Even if I am a bit groggy. And certainly more recently, the eczema on her legs, and elsewhere, is pretty much gone. I can feel a few bumps, but she doesn't have "chicken skin" everywhere. I wish I could say what we did, but it has just been time and healing. Eczema was never a huge concern for us, as it didn't itch or bleed, but it was rather sad, and not pretty. I don't know if she'll ever have baby soft skin there, but lack of bumps is pretty good! These things seem so small to me, given that her diet is still a short list of foods, so many other symptoms are still present, and right now we goofed and gave too much of a new probiotic so her behavior and mood have been difficult.... It is helpful to look for the sunshine amidst the clouds. Every day I praise God that despite her system being a mess, she's growing and learning and happy. And that is happening with food. If you hang out in the foodie blogosphere much, you'll come across many many recipes for cauliflower rice. Most of them involve either grating the cauliflower, or running it through a processor. I've done both plenty of times. And I perfected the cauli-rice flavor with the addition of eggs and select spices. Yum! So now I give you the further improvement of skipping all the mess involved with making it! 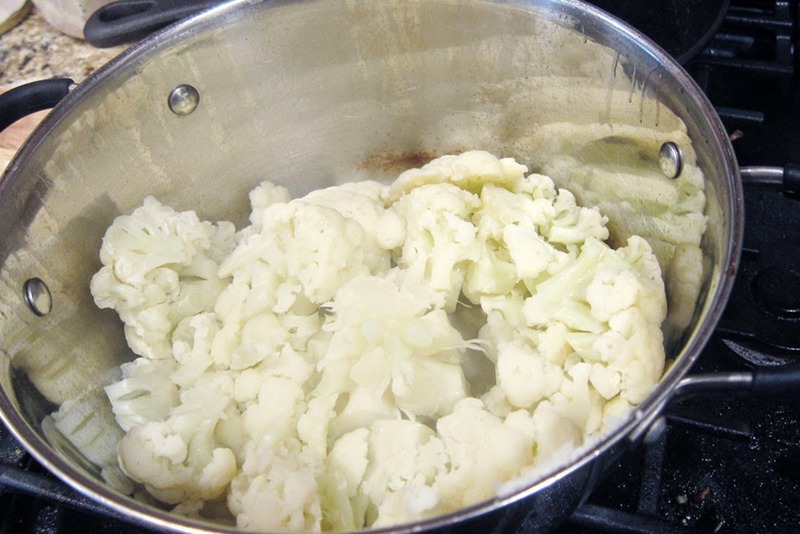 Trim and wash cauliflower, and place stem down in large pot. If you cut off most of the stem, it will be resting on the bottom most florets, but don’t worry about that. 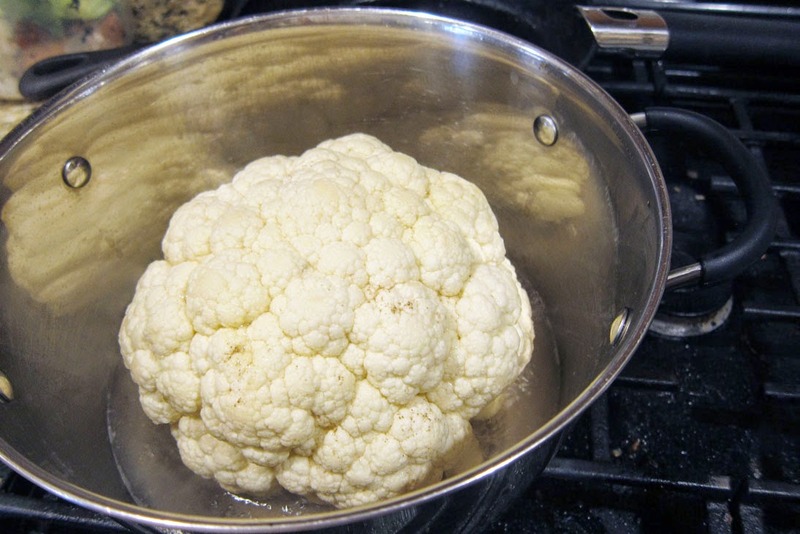 Pour broth into pot; it will not cover the cauliflower. Cook on high heat with the lid on until the whole head is very soft. This will take about 15-20 minutes or so. Check periodically for softness with a knife. When ready, use a knife to cut up some, right in the pot. 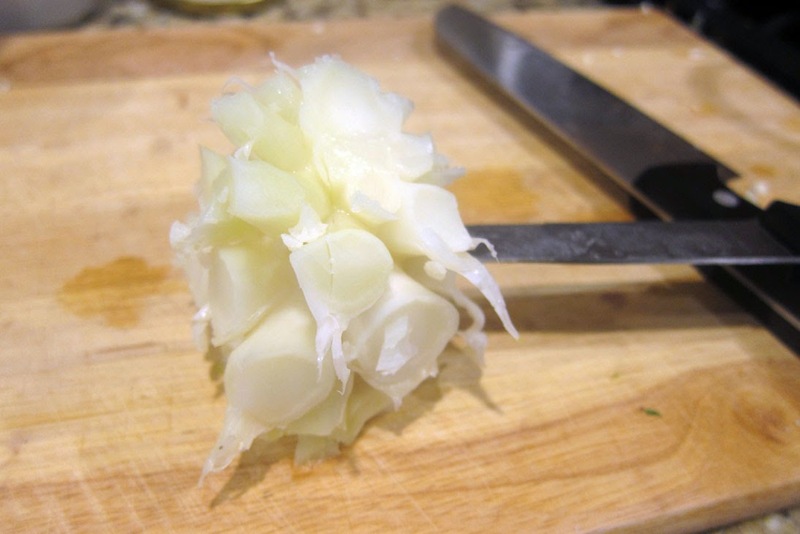 Ultimately, you want to cut out the hard center of the cauliflower. Once the hard center of the head is out, use a potato masher (or if you’re not too picky, just the wooden spoon) to crush everything further. You’ll eventually have nice crumbles. If there is any liquid, then turn the heat back on and continue to cook, stirring often. Add a minced onion and garlic at this time too. If there isn’t much liquid, then add a couple tablespoons of lard. See the florets being cut away from the center? And look, here is the center, ready for the compost. 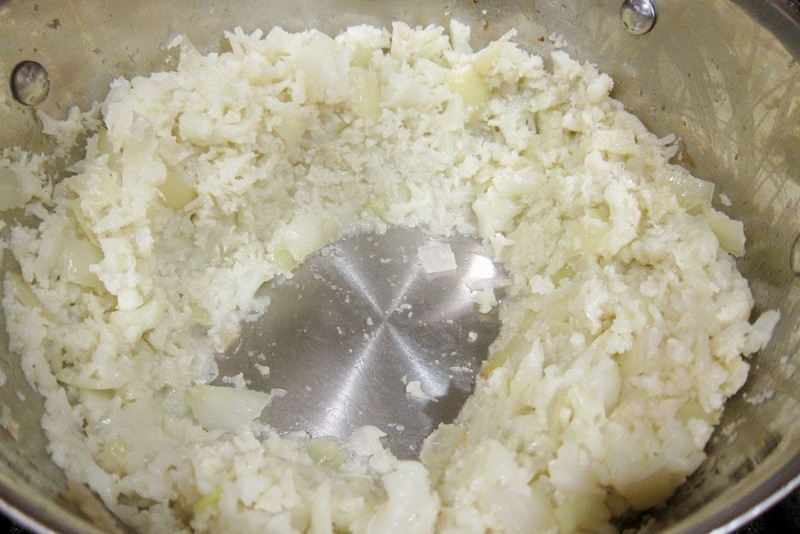 When everything is sufficiently soft, make a bowl in the middle, pushing all the cauli-rice to the sides. Add more lard and pour beaten eggs into the space. then slowly fold the eggs into the cauliflower as they cook. Cauliflower bowl, ready for eggs. When finished, season with spices and salt to taste. I usually stir-fry or boil a few other veggies and toss those in, then add in some fish or chicken or pork and a little fish sauce to taste! This tastes closest to fried rice, though if you season right I bet it could go with sloppy joes too.